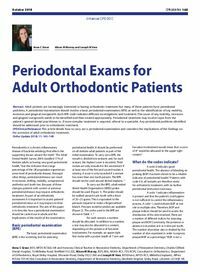 Abstract: Adult patients are increasingly interested in having orthodontic treatment but many of these patients have periodontal problems. A periodontal examination should involve a basic periodontal examination (BPE) as well as the identification of any mobility, recession and gingival overgrowth. Each BPE code indicates different investigations and treatment. The cause of any mobility, recession and gingival overgrowth needs to be identified and then treated appropriately. Periodontal treatment may involve input from the patient’s general dental practitioner or, if more complex treatment is required, referral to a specialist. Any periodontal problems identified should be addressed prior to orthodontic treatment. Clinical relevance: This article details how to carry out a periodontal examination and considers the implications of the findings on the provision of adult orthodontic treatment. Author notes: Anna C Greer, BDS, MFDS RCSEd, StR and Honorary Clinical Teacher in Restorative Dentistry, Department of Restorative Dentistry, Charles Clifford Dental Hospital, 76 Wellesley Road, Sheffield S10 2SZ, Alison M Murray, BDS, MSc, MOrth RCS, FDS RCPS, Consultant in Orthodontics, Department of Orthodontics, Royal Derby Hospital, Uttoxeter Road, Derby DE22 3NE and Joseph W Vere, BDS(Hons), MFDS RCS, MMedSci(Implants), MPros RCSEd, FDS RCSEd, Consultant in Restorative Dentistry, Department of Restorative Dentistry, Glenfield Hospital, Groby Road, Leicester LE3 9QP, UK. Objective: To describe a periodontal examination and explain the clinical implications of the examination findings.